The new headlights with DRL, LED taillights, foldable ORVMs with turn blinker, sunroof, shark-fin antenna, new alloy wheels and several other styling elements reflect the premium class of the car. 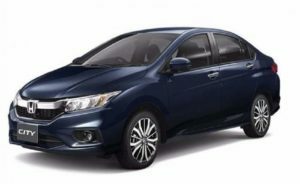 With a long wheelbase, Honda City offers great cabin space for the driver and passengers. The sedan comes integrated with eight-speaker stereo system with support for Aux-in and Bluetooth support. The 17.7 cm screen integrates visual Navigation system along with park assist system that displays objects while reversing. A climate control unit for passengers helps keep cabin temperature in check. There are power outlets in the front and rear for gadgets. An instrument cluster with the ‘Econ’ setting, a start-stop button, and several other advanced features find place in the City.